Did Jesus Use Parables to Hide His Meaning? Sometimes parables make us scratch our heads, and it can seem that Jesus was using them to deliberately confuse people. But even though they seem strange to us, they were a traditional teaching method that was always used to clarify rather than obscure. Looking at this passage in more depth, Jesus is actually explaining why his parables make sense to some people and not to others. 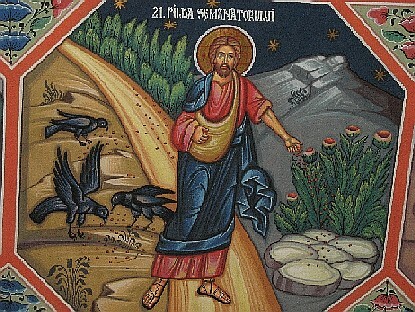 Here he tells the parable of the sower – that the same seed that grows well in good soil does not take root on the path, and produces little in rocky or thorny ground. The seed is always good, but the soil of human hearts may or may not be. The reason people don’t understand Jesus’ teachings is not because he is hiding anything. The lack of understanding is a problem with the hearer, not the speaker. Really, God is not telling Isaiah to confuse the people, but to proclaim the truth, even though God knows his teaching will be rejected by many. Jesus is saying the same thing – that like the prophets he speaks to clarify God’s word, but from hardness of heart, many will not hear or obey him. Photo: Sts. Konstantine and Helen Orthodox Church, Cluj, Romania.